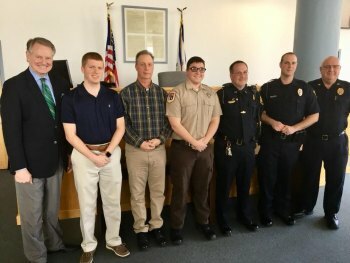 The Huntington Police Department conducted a promotion ceremony today for Cpl. John Colyer, who has been an officer for four years. The department also promoted Reserve Officer Richard Brunton to Captain. Brunton has been a reserve with HPD for 25 years. Also sworn in today were three new reserve officers: Ronnie Hicks, Ron Keesee and Austin Weaver. Congratulations, gentlemen! Pictured from left to right: Mayor Williams, Hicks, Keesee, Weaver, Brunton, Colyer, and Interim Chief Hank Dial.